When salespeople are prospecting for new clients, they need to cast a wide net in order to get a few bites. They also need to be ready and waiting for their prospects to respond to them based on the prospect’s schedule, not based on the salesperson’s desired timeframe. Salespeople need to be organized, respectful and methodical with their follow up. In these times of immediate reward and recognition, it is difficult for salespeople to be patient and understand they need to put in extensive time and effort in order to eventually be rewarded. They have to work every angle and be creative with every opportunity that comes their way because you never know what may come of it. The biggest client I ever landed took four years to catch. It started with developing a relationship with the receptionist. A year later, she got my foot in the door to present my menus to the large administrative team. This landed two years of lunch orders that eventually got me one of the partner’s attention. This partner eventually asked for a proposal for a holiday party. That holiday party became a $300,000 annual event for at least 10 years of my catering career (in addition to all that lunch business). I never gave up and I never thought any business was too small. I was ready, willing and responsive for whatever they asked of me. I never assumed their business was always mine and I was always prepared. This became the biggest client of my career. I was working in Puerto Vallarta last December. I took weekends off at my favorite beach club, La Carreta (read my other blog, Welcome Home). It was a typical Saturday at La Carreta and I was chatting to my regular pals when a lot of action started stirring just south of us on the beach. It was like a scene out of “Jaws” where a wave of people started standing up from where an odd water activity was taking place. What was it? Did people spot a whale close to the beach? Was it a dolphin? Was someone in danger? Actually, fish were fighting in the water just feet from the beach. Biting! Attacking! Splashing and whipping around like crazy! Pelicans were circling them causing even more of a ruckus. Suddenly, a fisherman showed up with fishing wire wrapped on a cable ring. He launched the wire into the ocean with a tiny piece of bait. He was at the location on the spot, ready to catch the big fish. This was incredible to see. Within seconds, and I mean literally twenty seconds, he whipped out the wire with a strong arm (without a pole might I add), and pulled in a torito (white fish) on his third attempt. To say we were all in awe of what happened is an understatement. I have been coming to this beach club for ten years and have never seen this before. Neither had my beach pals or the La Carreta staff. That fisherman was amazing. He was ready, had his “tools” and got his prize. We all clapped. He smiled, grabbed his fish and walked away. Be ready for your big fish to come your way. The best salespeople ask endless questions, stretch beyond their comfort zone and are continuously on the quest to learn more to be the best they can be. The elite sales managers I mentor and coach push their teams beyond the scope of the 9-5 job. Sure, we can all do our job but after a while, it becomes the same & we want and crave more. So how do we mix it up? How do we reboot after a busy season and want to start all over again? How can we be inspired to learn new things? We are fortunate to be in an industry that provides an abundance of educational resources that are affordable, accessible and practical. We can join associations that provide relatable webinars, peer networking and regional workshops to teach us more. (Tip: Check out internationalcaterers.org). We can attend conferences to give us that annual boost to inspire us to think differently, hear fabulous speakers, attend trade shows and network with our peers. (Tip: Check out catersource.com). We also can dine in our respective cities, watch hospitality-designed programs, read magazines, engage in social media and travel. I participate in several outlets to continuously educate myself and keep “my” industry and business fresh. I am honored to be on the ICA board for my sixth year, presently as the President’s Council Chair. I am an active Advisory Board member for Catersource. My coffee table is stacked with magazines to keep me inspired. I invest in travel to open my eyes to other cultures, foods and people. Due to the geographic jackpot, I was able to spend four working day and nights in Lyon, France prior to meeting travel companions for a driving tour from Geneva, Switzerland to Munich, Germany. Lyon has always intrigued me as a city who’s people live and breathe food & wine with a passion. I had to invest the additional time, money & my curious and adventurous spirit as a solo traveler in order to educate myself on this historic and fascinating city. To say the Lyonnais are passionate about food is an understatement. 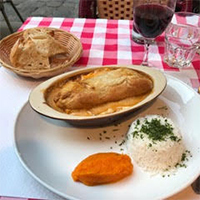 Each evening I dined at a typical Lyonnais bouchon, which are warm, cozy restaurants serving regional, hearty specialties. I enjoyed local red wines, served in “pots” or “fillettes”. Paul Bocuse’s (may he rest in peace) love for his town and influence is felt everywhere. I visited his namesake culinary and hospitality school as well as the magnificent food hall, Les Halles de Lyon- Paul Bocuse. I grabbed my book and shopped with the locals at the Saint Antoine Market for fresh fruit, cheese and a baguette to eat a simple lunch along the Rhône. 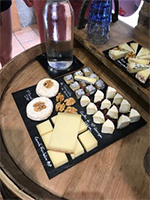 I signed up for a fantastic four-hour walking food and wine tour through Vieux Lyon that started with tasting local Saint-Marcellin at the fromagerie (cheese shop) and included stops for pates, local wines, authentic Jésus de Lyon (dry cured sausage), incredible ice cream, local craft beer and ended with the famous tarte aux pralines. Throughout my journey I took photographs, notes, menus, asked questions and was an inquisitive “student”. I wanted to better understand the beautiful culture that celebrates the “joie de vivre” lifestyle and that approaches food and beverage as a significant moment in every day life. This was important to learn and be able to bring back to clients back home. As leaders in our industry, it is imperative that we encourage continuing education. We must provide inspiration, guidance and financial resources for our teams to get out there, explore new ideas and then share with the entire team. 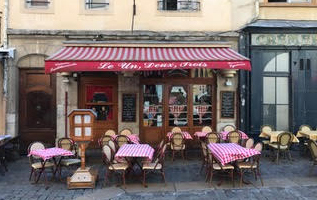 I know traveling to France is a fortunate and once-in-a-lifetime experience, but it is up to you to find your “France” in whatever outlet you can. It can be a road trip an hour away from your home as much as it can be a new restaurant in a different neighborhood in your own town. Just go out and start exploring. Get excited to get out there, be willing to learn, share your findings and continue to be the best you can be. As a seasoned sales manager, it has been fascinating watching the media coverage of Amazon as it searches for it’s “second city”. Finally, a relatable case study that non-salespeople can understand what we really do! I have been following each step of the sales cycle as many cities have been vying for this big deal. There are so many steps including the discovery process, delivery of proposals, site inspections, elimination of competitors and the final few cities still standing. Then, the waiting game. Sales is not cut and dry. It is not just lunches, cocktails and afternoons on the golf course. It really does take time, effort, money, research, creativity and thoughtfulness for a sale to happen. However, it also takes one very important element which is often overlooked, qualifying the business opportunity. Salespeople often feel the need to bid on every piece of business that comes their way. They cast a wide net hoping for a few fish. They are afraid to ask questions that will save them time and ensure they are the right fit. They make promises with the best intentions of figuring it out if the sale happens. No worries, we are caterers, we can figure out anything. By ignoring the qualifying stage, salespeople are wasting their own as well as other team member’s time. This is a true opportunity cost that could be spent on business elsewhere that is truly tangible, attainable and profitable. Time wasted is money wasted. The most impressive news piece regarding the Amazon search was in the Wall Street Journal, May 2, 2018, titled “Hi. It’s Amazon Calling. Here’s What We Don’t Like in Your City”. Amazon is actually calling on some of the cities that have been eliminated to tell them why. And kudos to the cities that have actually asked for the feedback. Essentially, these city leaders should be learning from this process for a next time. Were they qualified to bid to be the second city? Did they read the RFP? Were they truly capable of fulfilling all Amazon defined? How much time, money and human resources did they put into the presentation? What can be learned for next time? What changes will they do when the next opportunity arrives? Chicago is still a contender in the Amazon bid for their “second city”. Two potential locations for their campus are within blocks of my office on Fulton Market. It will be interesting to see where this lands and if Chicago has what it takes to make this sale happen. For the amount of time, money and effort spent thus far, if we do not get it, I hope the city learns from the loss so they are ready to tackle the next RFP that comes our way. “I need you to work with my sales team. I want them to stop being order takers." This is the most “frequent” request I receive from potential clients for my consulting services. “Do they have goals? Are their expectations defined, agreed upon and most importantly, written down?" 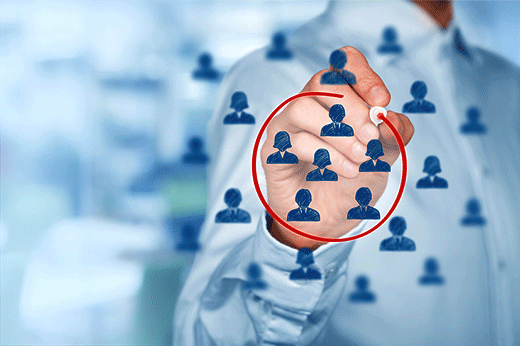 Goals for salespeople are not just numeric. Goals can be anything and I encourage goals to be broad and creative. I recommend all sales team members to have 3-5 written goals defined each year. They must be SMART. How do you make them SMART? Specific—What do you want to accomplish with this goal? Measurable—How are you going to know when you reach your goal? Achievable—Is this goal possible based on your available resources? Realistic—Why do you want to set this goal and what result do you want from it? Timely—What deadlines do you need to set to feel successful and keep yourself on task? Start thinking about what goals you want for yourself and your team, have a brainstorming session and start writing down ideas. Let your team members come up with their own ideas. Each salesperson should always start with their annual sales goal and then develop two to four additional goals. These goals can be professional growth as well as personal achievements. And work through these for a few weeks until they start making sense to both you and your team. Just write them down to make them real and make adjustments as time moves on. Remember goals can also be fluid. Life changes, things change, but don’t let them change to make the challenge easier. Keep pushing yourself and your team so that they ALL reach their goals! ¡Olé! Futból is my favorite sport. (Soccer for us Americano’s). I grew up in an Italian-American neighborhood in Upstate NY during the 1970’s surrounded by passionate soccer fans. Playing street pickup games every summer night. Tagging along with my sister’s travel team every weekend. Watching Pelé play the Rochester Lancers in August, 1977. I couldn’t believe it; Pelé was in my town! The soccer field was often a setting for several of my early life’s significant moments. To no surprise, futból became a significant player in my own recent goal setting. In July 2014, I spent ten days in Playa del Carmen, Mexico with my sister and a friend. We planned on enjoying margaritas, beach clubs and the sun. What we did not realize was that we scheduled our trip during the World Cup which is the ultimate tournament for true futból fans to watch matches together. Fortunately, we were in a country that worshipped the sport and surrounded by people that lived for the next game (the tournament was in South Africa; we watched in bars, on the beach, you name it). One day we were El Tri fans; the next day we were Team USA. It didn’t matter—it was just a ball surrounding ourselves with people that were so passionate about the sport. What does this have to do with goals? Because travel, meeting people, developing friendships and the beauty of memories of unexpected events makes one want to return to that place. I have been back many times now to Playa; each time enjoying new experiences while also visiting familiar places and friends. It was on one such trip in January 2017 that I decided to set a new goal for myself … to start my own business. I wanted to start my own consulting company. I drafted that goal on my terrace in Playa del Carmen. I wrote it down. I rewrote it. I made it specific, measurable, achievable, realistic and timely. It was SMART. The “Beautiful Game” taught me to start working for the life I've always wanted. To travel to Mexico and work there whenever I can. To be around people who have such a love for life. To train hard and work hard. To set goals and achieve goals. And to remember to keep score for myself and my achievements. Sure, there have been a few yellow cards, but no penalty kicks yet! Now it’s April, 2018. I’m on that same terrace in Playa del Carmen. Sharing this story. Working from Mexico. Set your mind to it, work hard and make it happen. Go for the GOAL. ¡Olé! It’s Time to Get Back to School … Sales School! Ah, as an original Upstate New Yorker, there was nothing like this time of year. Crisp autumn mornings. Gorgeous yellows, reds and changing greens of leaves. Apple cider and cinnamon donuts. Football. Jeans and sweaters. Going back to school. Living in the Midwest now, I still get this fabulous change of seasons and September is still my favorite month of the year. I LOVE THE FALL! There is something else I always loved about this season … it was also that time of year when I would sit with my sales stars to develop next year’s goals, individual sales strategies and plan for the upcoming year. It was that time to recollect on the year thus far, look at what worked, what didn’t work so well and focus on what was ahead. It was mentally “back to school” time to buckle down, strategize and get their individual plans together. As their sales leader, I then collected all the individual plans to develop a company wide annual revenue goal with overall strategic plan. Why did I start this process now? I wanted it to be methodical, well-thought out and “massaged” so the final result would be completed and buttoned up by mid-November. Once the holidays hit, we were all too busy to focus on anything strategic and then boom, it’s the new year. This strategic goal development process is a daunting task if you have never tackled it before. However, it is imperative for sales and executive leadership to encourage this as they grow their organizations, now. SALESPEOPLE WANT GOALS. They want to be successful, accountable and have defined expectations. The easiest way to start measuring tangible success is writing down an agreed upon achievable numeric goal. This is the first and initial step toward individual sales success that in turn results in team success. Get your team back to school now. Do not wait until the new year begins. That’s kind of like being the last person in the lunch line.